Though barren in most areas, Sal is one of the most popular islands and the most touristic in Cape Verde. It does not only lure one to its interesting inactive salt mines that made the island flourish during the Portuguese empire; it boasts wonderful white sand beaches and clear turquoise waters. Espargos is Sal’s administrative capital where many shops, bars and restaurants are located. Santa Maria is the island’s centre of waters sports and its most developed area in terms of tourist facilities. Divers, surfers, and windsurfers hail it as a paradise. It is also favoured by those who simply want to relax and indulge in one of its great hotels. Aside from beaches, there is also a natural swimming pool in Buracano and the salt lake in Pedra de Lume, an extinct volcano. Santa Maria is the main reason why the island of Sal is very popular to locals and tourists. It boasts white sand beach resorts with great hotels and water sports facilities. It is simply heaven to surfers, divers, and windsurfers. Real estate development in Santa Maria and nearby areas is in boom. Many small bungalows were torn down to make way for hotels and apartment blocks. Some hotels are also being converted into residential flats. Popular residential developments in Santa Maria are the Morabeza town apartments, the Vila do Atlantico complex, and Belorizonte and Oceana Azul on the beachfront. A new residential building called Ca’ Carolina is located near Antonio Sousa Beach, which is great for windsurfing. Cabonuba residential complex is also located near Santa Maria. It includes luxury hotels and a shopping centre. About 400 metres from Santa Maria beach is the small White Sands resort consisting of 31 apartments with 8 single-bedroom penthouses. Ponta Preta in Sal is Cape Verde’s windsurfing capital, hosting prestigious international events such as the Trilogy windsurfing competition. It presents challenging conditions—strong undercurrents, offshore winds, waves breaking into rocks—even to the most experienced of surfers. Luxurious real-estate developments can be found in Ponta Preta and its surrounding area. Tortuga Beach Resort and Spa is one of Cape Verde’s finest residential developments and just a short walk from Ponta Preta beach. It offers 306 2-bedroom luxury apartments, 40 2-storey detached luxury villas with 3 bedrooms each, and 12 single-storey detached luxury villas with four bedrooms each. All properties are located on the beachfront. Villas have private pools and gardens and apartments have terraces. Exclusive amenities in Tortuga include a 5-star hotel, 2 swimming pools, a fine restaurant, a luxury spa and gym, a wine bar, a piano bar, and several shops. The 5-star Dunas Beach Resort and Spa is also located on Ponta Preta’s beachfront. 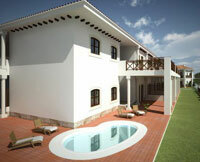 Here, price of villas can go up to €500,000 while apartments can go up to €200,000. Sal’s Paradise Beach is a luxurious beachfront development consisting of a 32-suite 4-star hotel, 22 4-star detached villas with private pools, 12 deluxe semi-detached villas, 188 3-bedroom semi-detached villas, 202 2-bedroom apartments, and 97 3-bedroom duplex penthouses. It is beautifully landscaped with tropical gardens. The hotel offers restaurants, bars, a conference hall, an internet café, and a health spa. Other facilities in the complex include boutiques, a supermarket, a medical centre and pharmacy, 2 tennis courts, 12 swimming pools, a beach volleyball court, a beach club, laundry and dry cleaning services, wind and kite surfing shops, and a driving school. 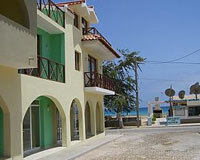 Murdeira is located on the west coast of Sal, and the site of the 29-hectare, 5-star development Murdeira Beach Resort. It consists of 294 villas and apartments with panoramic ocean views, dining areas, swimming pools, tennis courts, gardens, sun lounge areas, and a 75-berth marina with commercial units, a diving centre, restaurants and bars.